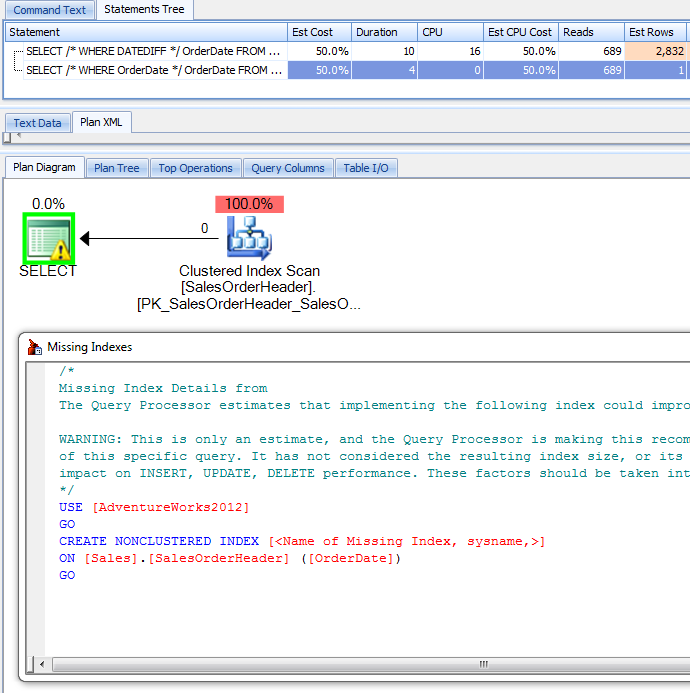 [英]Is this date comparison condition SARG-able in SQL? My rule of thumb is that a function on the left makes condition non sargable.. but in some places I have read that BETWEEN clause is sargable. So does any one know for sure? What makes a SQL statement sargable? Notice too how the estimates are way off for your version of the query. This can be absolutely disastrous on a large data set. There are very few cases where a function or other expression applied to the column will be sargable. One case I know of is CONVERT(DATE, datetime_column) - but that particular optimization is undocumented, and I recommend staying away from it anyway. Not only because you'd be implicitly suggesting that using functions/expressions against columns is okay (it's not in every other scenario), but also because it can lead to wasted reads and disastrous estimates. Which I believe will be sargable (even though it's not quite as pretty).